The most rigorous Circling and Authentic Relating training the Integral Center offers, the training we are by far most inspired to teach each year. Join us to master the Art and Science of Integral Circling™. You can get very, very good at guiding people to very, very deep places. You can get damn good at it, very fast, if you jump into it fully. Once you gain proficiency, you can create unforgettable moments with anyone in any moment…seriously. Moments that a person can look back at as a fork in the road towards a more rewarding life, for them and everyone around them. Once you gain proficiency, you can also be certified as an Integral Circling™ facilitator and plug into an international community of teachers, facilitators, & general do-gooder types. Whether you’re looking to network professionally or not, this is an extraordinary crew of people to connect with, surfing the wave of conscious evolution so gracefully I’m grateful to know every single one of them. Could you be one of the 28 people who will show up for 9 months next year to practice such deep learning in community with us? Of all our trainings, T3 is the most rigorous and the deepest dive. It’s our behind-the-scenes opportunity to have the IC senior team train you in our relational practice informally called ‘Circling’ (see below). 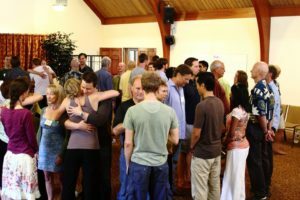 As you may already know, this is an extremely clean and efficient way of co-discovering one another through raw experience, feedback and coming to see our relational blind-spots we’d often been “swimming in” for most of our lives. This will require you to go deeply into yourself, don’t think you can escape having your own life profoundly impacted as you learn how to ‘support everybody else’. The more open and aware you become the more you will naturally inspire others to follow suit. Some of the deepest circles we’ve seen, people hearts cracked open without either of us saying a word. But it also requires that you learn, and practice intensely, the principles and fundamentals of Circling. That’s the 1-2 combo…get the fundamentals down, practice taking people *deep* many, many times AND get circled intensively yourself. Know intimately what it’s like to be Circled, the in’s & out’s of feeling resistant, of not feeling much of anything, of suddenly cracking wide open to depths you never knew were possible…of living with a genuine humility and curiosity about what else you have yet to discover about yourself. It’s an advanced training, and many students in the series have already spent years training and leading with us to prepare. That said, there are no prerequisites for the series. We have personal conversations with each of you to ensure you’re ready to take full advantage of the curriculum, and personally customize the intensives for each student to make sure it meets you where you’re at and maximizes your time here. This series will teach you our most advanced interpersonal change work and the skills (with on-line playbook) for leading deep relating events for your community. If you reach proficiency in these very full nine months, and pass the final certification, you will be given access to and included in an international network of community leaders focused on conscious evolution through the experience of being in authentic community. Please fill in the form below right now to schedule a conversation about joining our Boulder Train the Trainer cohort. We guarantee you will benefit from the exploration regardless of the outcome. In between each weekend we will have periodic group coaching calls, and everyone will be practicing in triads to more deeply integrate the practice and process. Circling is our homegrown inter-subjective meditation practice in which groups of people can support each other delving into the states of awareness normally accessed through sitting on a cushion alone for weeks at a time (or years…). For the record, we’re a big fan of those individual practices AND a relational practice can massively accelerate your evolution of consciousness when undertaken with care and skill. We have very, very rarely found a style of supporting people with this depth of impact AND with such minimal contrived biases, models, or belief systems that often come with the territory of ‘transformation’. Our primary vehicle for supporting/coaching people begins by continually letting go of those models/belief systems/assumptions, and putting that freed up attention on experiencing profound connection with each other. By coming to “get their world”, layer by layer, you can actually help *them* get what their life is like in an increasingly clear and rich way. By vulnerably expressing my experience as I’m with you, we begin to invite each other deeper, layer by layer, moment by moment. Many aspects of that process make for exquisite moments in any conversation, professionally or socially. 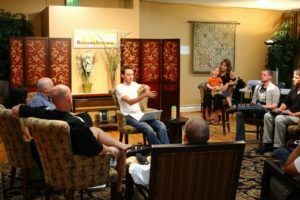 Focusing that process into an explicit practice…has lead thousands of people to those kinds of realizations that you can look back at as the moment life would never be the same (in a way you’re happy about). Eric - from The Integral Center on Vimeo.